I am home again after teaching at Penland School of Crafts. 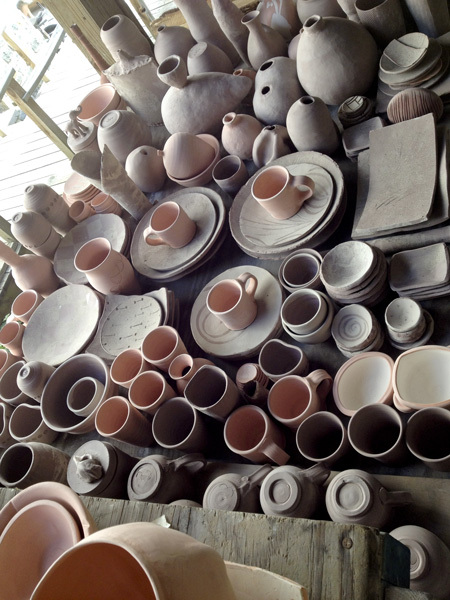 My class was working in the upper clay studio and its goal was to fire the wood kiln. The pace of a two week session is very intense. We had to make all the work in the first week so that we had time to dry, fire, and cool the kiln before the end of the session. 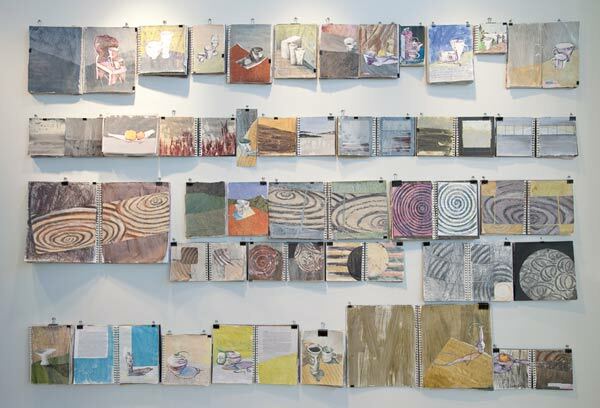 My concept was that we would make enough work to fill the kiln, fire it and get into a rhythm of producing drawings, collages, and notes. I hoped to give the students a recipe for working and a process for digesting and developing their own ideas. Back in my studio, unpacking tools, pots, and notebooks, I am trying to assemble my experience of the session into some kind of order. For me that means drawing and collaging. While collating the paper shards into one notebook I am drawing not only what I made, but also what I imagined making and what my students attempted. Roosting in my own house where my husband and I--as well as the dog--walk and talk in small circles, it is a stark contrast to Penland's variety of studios and the large circular tables of the Pines dining hall. While we are also in rolling hills, the vistas of the North Carolina valleys are steeper and mountains feel deeper; the momentum of such varied studios making disparate objects was energizing. At one dinner I asked Chris Benfey, the session bridging writer-in-residence, what he was working on. Chris said he had been re-reading The Jungle Book by Kipling and was tussling with the difference between when Mowgli is kidnapped by the monkeys versus his adoption in the wolf family. He was curious as to how Kipling manipulated our allegiance to the wolves and our agitated antipathy to the more human-like primates. On my drive back to Virginia I thought about how the Japanese had invaded Korea in the very late 1500s and kidnapped whole villages of Korean potters. The Japanese have had a long history of adapting Chinese ideas and making them their own, but in this instance the so-called pottery wars led to a Korean infusion into Japanese aesthetics, the discovery of porcelain and fundamental alterations to various ceramic traditions. I wasn't totally sure what to make of these conflicting concepts, but somehow it also resonated with another contrast discussed by Rachel Miller, the teacher of wearable sculpture. In her slide talk she contrasted the idea of a treadmill versus the labyrinth. Do we keep our hands making because we need the exercise or do we do it with thought and meditation? Does an external influence enhance our practice or do we just tramp along in our same old rut, stomping out new potentials without thought. 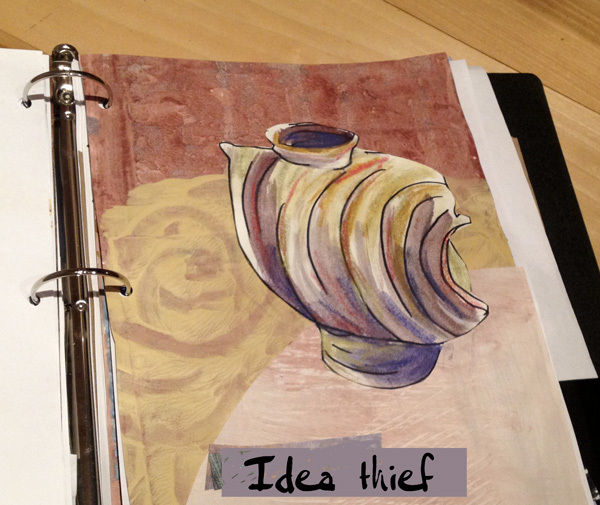 In my process of digesting my experience of teaching and firing, I ran across a note captured during one night of instructor images: "Idea thief." Often when I look at the work in a teaching studio after a well known artist visits, the pieces that students subsequently make seem like they have been generated from kidnapped tricks applied to their own materials and firing techniques. 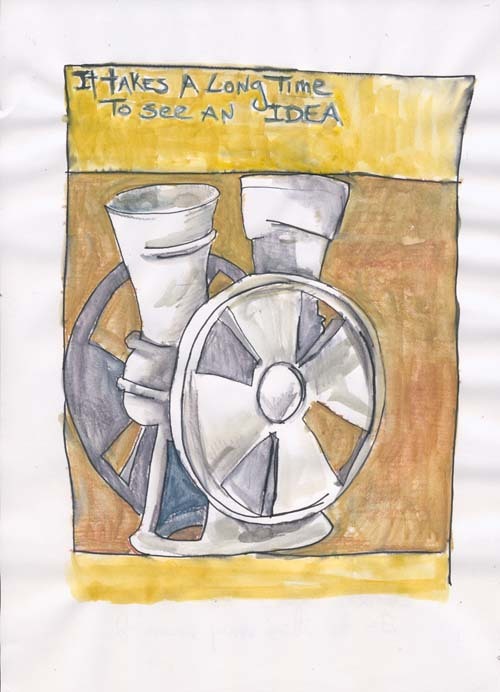 It occurred to me that what I want is for my students is to adopt ideas, not to kidnap them. I hope they have imbibed inspirations that motivate their own aesthetic path. 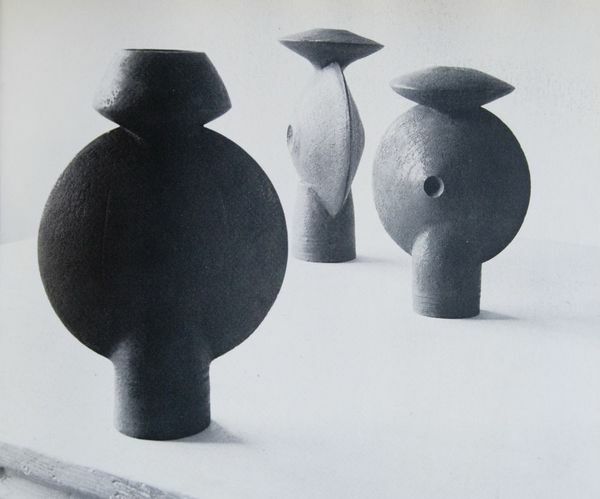 Returning to their own studios I urge them to nurture new approaches to their materials, to cultivate their concepts for making and using objects, to reinvigorate their perceptions of form and perhaps to apply new theories for stacking and firing their kilns. "For Benfey, ceramics also possesses the explanatory power of metaphor, standing in for all artistic creation. It represents what people make of places, literally and otherwise. Transitory wayfarers pause, grasp what lies beneath their feet and form it into creations both utilitarian and beautiful. The handle of a pot, he writes, 'marks the journey from one world to the other; it is the suspension bridge from the world of art to the world of use.' "
The smell and taste of fresh mint will forever remind me of summer and my mother. She loved mint in everything from her drink to her dessert. Tonight I was headed to a potluck dinner and my assignment was to bring dessert. Feeling summery, I thought I'd bring something with mint from the garden. My father loves to tell the story that one summer night my mother sent him to the store to buy ice cream to go with blueberries. He came home with mint chocolate chip and my mother was furious as she thought that was a terrible combination especially when they had company. It turns out that dad really likes the combination of blueberries and mint chocolate chip. As I concocted my dessert plan I thought mint and blueberries would be good and maybe I'd get some ice cream (made from coconut milk) and oh, why not have a nice bar of dark chocolate as well. All of a sudden it dawned on me it was a replay of mint chocolate chip with blueberries and mint. But in reality, I ran out of time to go shopping, so we all happily vanquished the dark chocolate and cookies. I can almost see my mother's face. I have been printing raw slips on what I call clay pages. 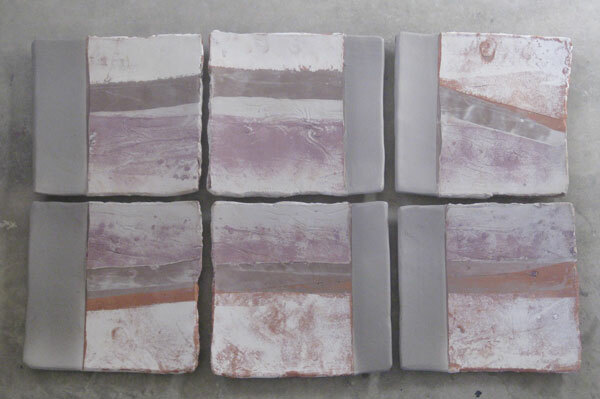 They are slabs I roll that are very thin and have been bisque fired. 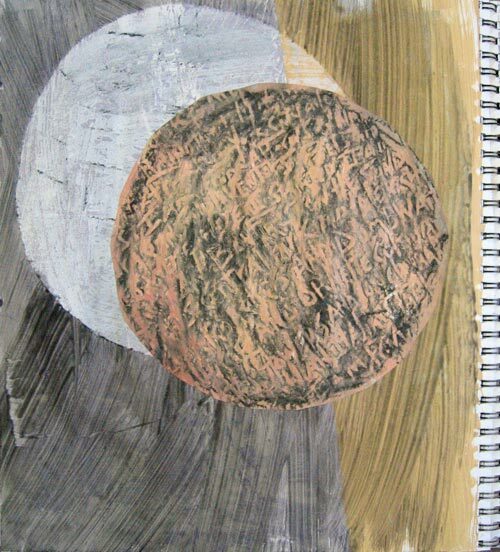 The clay page images are distillations from a series of collages in my current sketchbook. The collages are based on photos taken on my dog walks. For a couple of years I have been thinking about horizon lines and now with the focus of intersecting trees I see the landscape with a fresh eye. After yoga one day I snapped a photo of a fence post with torn wire fencing and the Naples yellow field behind was cut by the pale blue winter sky. I didn't see the connection then but as I drew from my image I saw the correlation to my plates. The last few afternoons I have walked with my camera looking for the intersection of bare tree trunks and the fields beyond. The sky weights the hills down. These colored drawings are becoming clear fodder for my slab plates. Urban myth has it that when Bob Dylan first heard the Beatles' Sgt. Pepper's Lonely Hearts Club Band, he only made it through the first few songs. He turned it off afraid his own creative process might be influenced or blocked by the inspiration of the Beatles. I find that I need to look at lots of stuff. I need the stimulation of other artists and visions to translate and focus my own ideas. My motivation grows by seeing other versions of excellence. 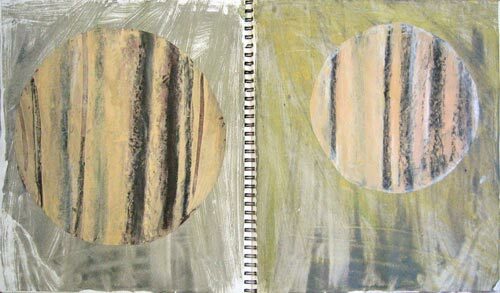 I remember being inspired by Sean Scully's paintings when I saw them at the Met a few years ago. He opened my eyes and heart to brushy stripes of resonant color. 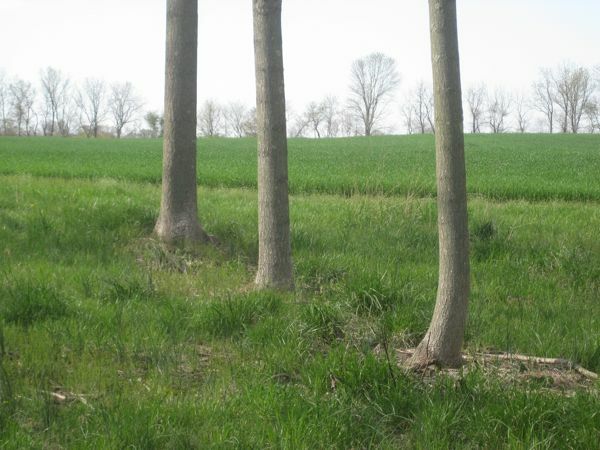 I am revisiting my horizon plates and interrupting them with fence posts, tree trunks and window mullions. Last weekend I was also very taken by a series of images called Sunday walks and Shower songs by Leanne Shapton the former art director for the op ed page at the New York Times. If you have time you should check them all out. I have been reading about Hans Coper recently. I am always taken by his ability to take an idea and explore the variety of a single theme. He was concerned with an modern feeling of form. 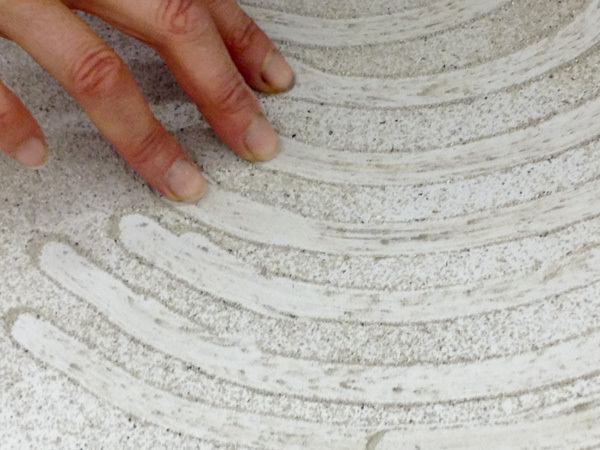 The quality of surface was developed not in terms of decoration but integrated through layers of slip sanding and rubbing he created depth. When I am taken with an artist I try to look at not only what they did but where they derived their inspiration. 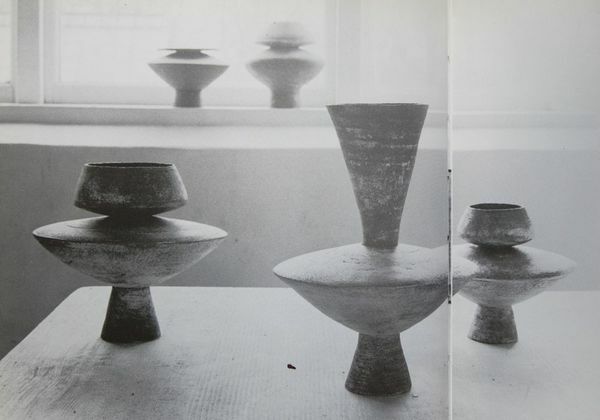 Coper had a great love for cycladic forms and admiration for the sculptors Brancusi and Giacometti. 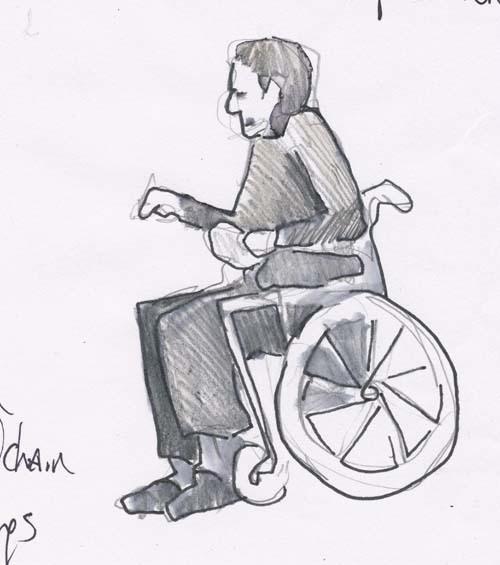 As I am slowed down by my fracture and get around on crutches and a wheel chair I am struck by the photos of Coper in his wheelchair at the end of his life. 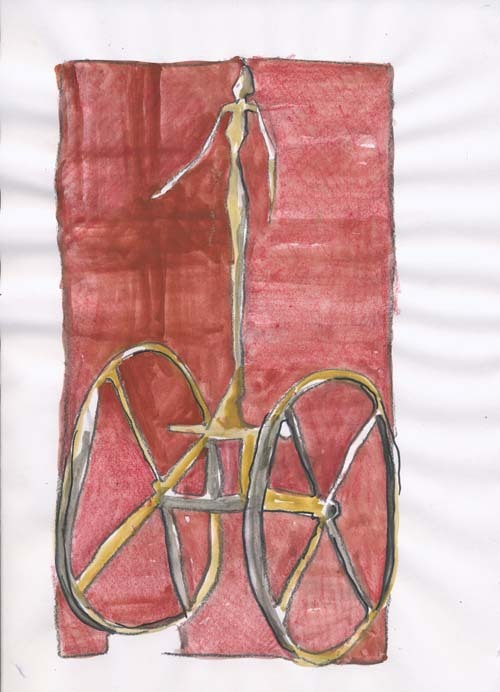 Images of sculptures and pots that include wheels ignite my imagination and pen. 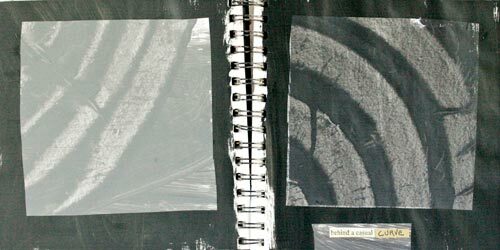 In May I installed a series of my sketchbooks as part of an exhibit called Sculpting Time at VisArts in Rockville, Maryland. 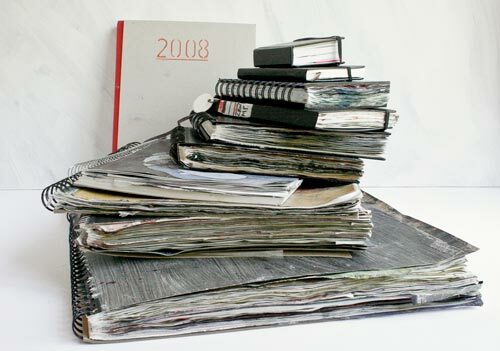 These notebooks represent images and writing that have accumulated over the last several years. I try to write five days a week as part of my process of finding direction and clarifying ideas in my work and life. 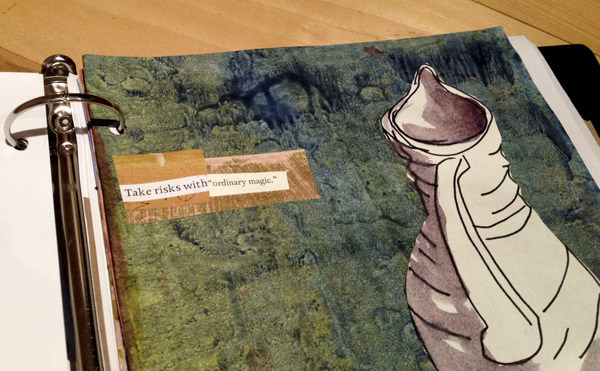 I write three pages and then paint a page with color which later gets an added collaged drawing. 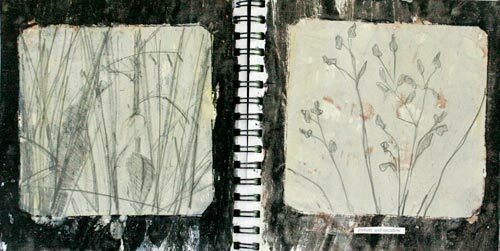 Some notebooks are only visual records of what I am pursing in the clay realm and some are collages of the varied streams of life. They are like the lining of my mind. 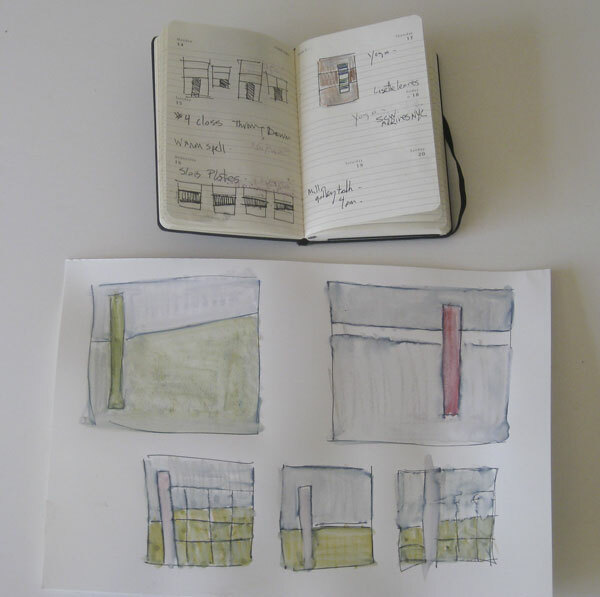 This week one of the notebooks was stolen from the gallery. I am stunned. Suddenly the memory of what those pages held gains importance. 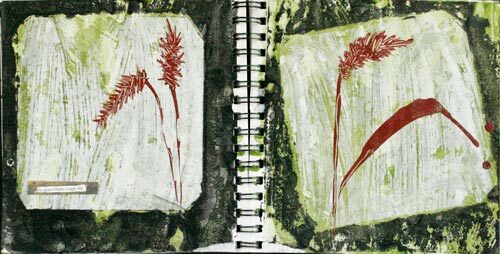 From each volume I have selected one single page or spread to exhibit, but the whole book lost represents a month or more of personal reflection. The report that the notebook is gone comes on the heels of the news that my parents' summer cottage has had a major fire. The fire began in the kitchen which is now destroyed. Over the years my mother had brought many of my pots to use there. I am struck by how those objects held snapshots in time. 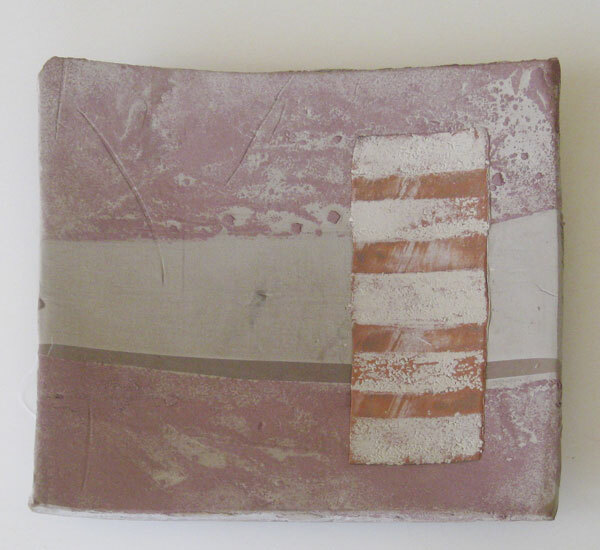 Particular moments are captured in the clay when I experimented with texture, color and simplicity. 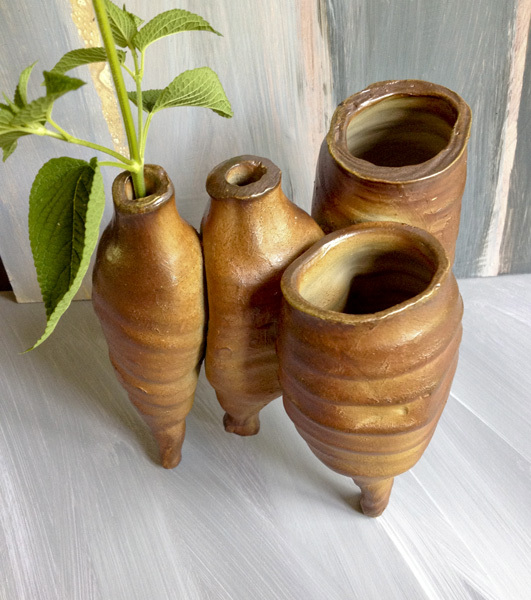 I may revisit those ideas but I will not be able to make those pots again. 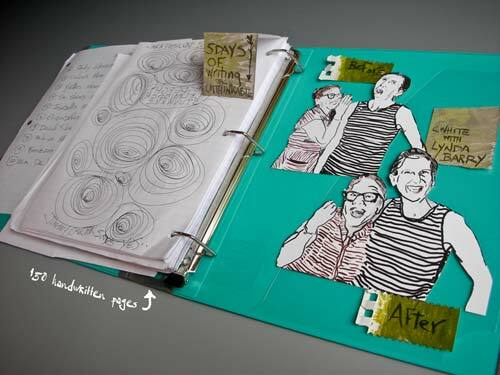 I really liked the notebook that was stolen and so luckily I had scanned many of the images. 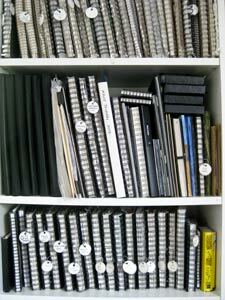 I had used several of the pages of writing as the basis for other projects, so I know the gist of what the pages held. I plan to recreate a book called The Lost Notebook; rather than mourn its loss, there is the hope that I will come up with something better than the pages that are gone. "Barn's burnt down ... Now I can see the moon"
This summer has not included much formal clay/studio time. Instead I feel like the character Frederick The Mouse from a book by Leo Lionni.This book is a great antidote to narrow thinking and is a wonderful allegory for the role of the artist. While all the other mice are collecting seeds and supplies for the winter, Frederick, who has the heart of a poet, collects images to get all the mice through the winter. I have been collecting images all summer. 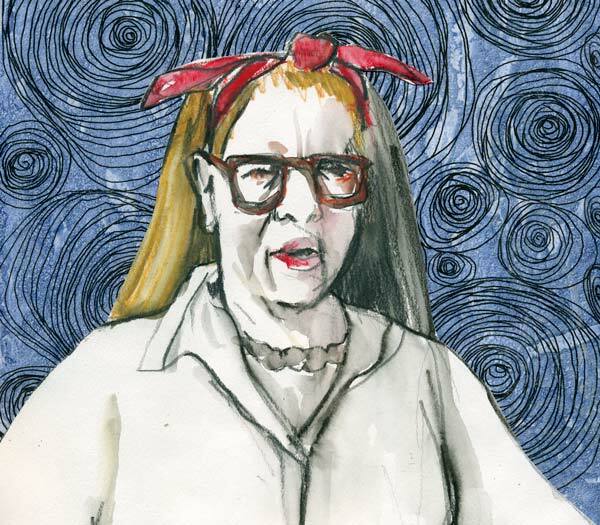 I spent five days at Omega Institute in Rhinebeck, NY taking a class with Lynda Barry. It felt like a combination of five days with a stand-up comic and deep exploration of my childhood through the cultivation of images and finally words that add up to breathing stories. Our days were filled with making lists and visualizations of images from our lists and then, expanding them into seven-minute timed writes. If we lost the image and didn't know what came next, we switched to the piece of paper next to us and drew spirals or the alphabet--always keeping our pens moving . It felt like fishing with a pen in the sea of images that make up the ocean of my childhood and the origins of my imagination. We read out loud with no comment or eye contact. While I listened I drew more spirals. I loved listening and drawing. It is a very fertile way of working. While I listen my brain is turned off and I am just there. My pen is moving and I can trust my gut. In this case we weren't looking at anything but the page with intense consideration. By hearing other voices I was reminded of the kind of image that is alive. I remembered friends' names that have been lost to me for years. I invented a character based on my experience with just facts no emotion and I got some profound laughs when I read it aloud. We did not re-read our work all week. We did not talk about the work outside of class. We watched movies and took naps together. It was exhausting, inspiring, and exhilarating all in one breath. 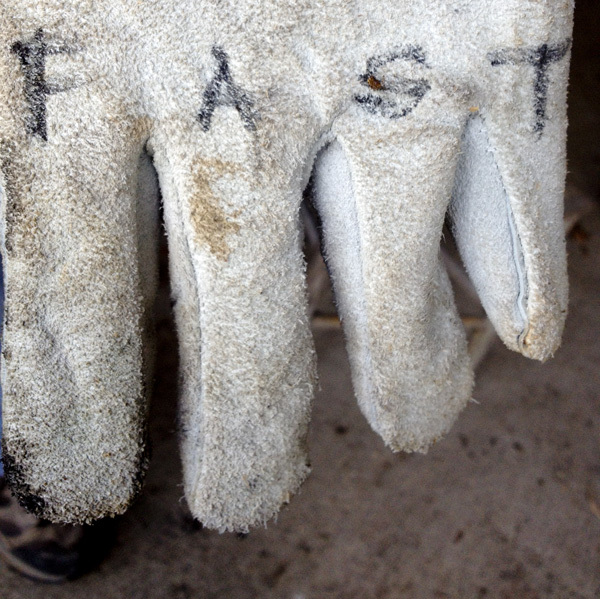 The important thing I took away had to do with working by hand. 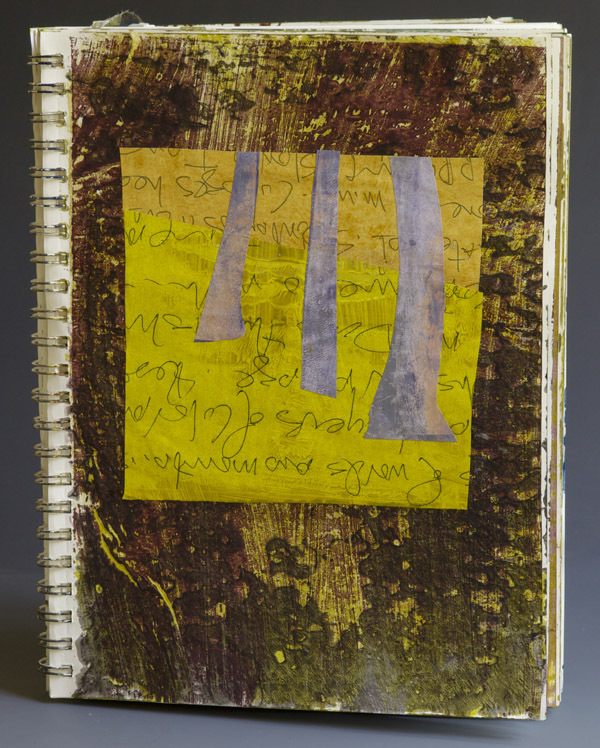 In my normal process I write with a pen in a notebook and draw with pens and pencil, later adding water and collage. Then I type up my words and email them to myself. When I see them again as a separate image (legible and spell-checked) I can continue to expand and elaborate. This always seems insane but somehow Lynda's approach added depth and validation to what I have been building upon since I was a kid. 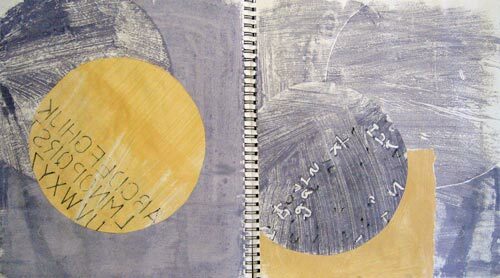 At one point I thought I had a notebook illness, but instead I have come to realize that these many books are my assets--the varieties of shape, size, and function push new problems and suggest new solutions.Yesterday I posted circular plate images drawn from rectangular books. 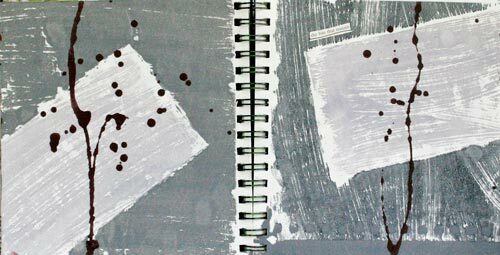 Today's square plate paintings are pulled from my 8-inch square notebooks. 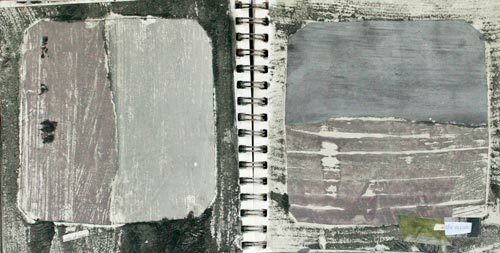 My sketchbooks serve as both a private place to experiment and a portable stage to carry and to show-and-tell what I have been fooling around with. The books hold ideas in more or less chronological order. I do get ahead of myself laying in color, but then I go back and add more layers. The books become a collection spot for bits of sketches, idea scraps, color, a stray word or two, and an occasional quote. Working on a small mailing I decided to use handmade envelopes. These are made from experimental paintings for plate ideas. 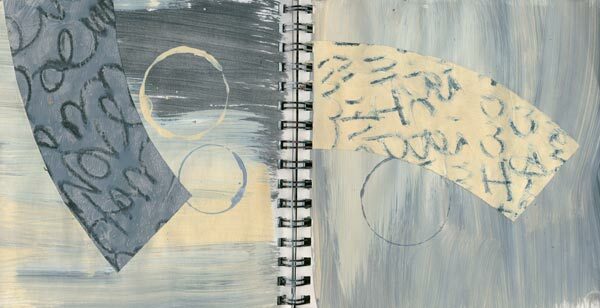 Sometimes they are scrap paper that I insert behind the page I'm working on so that I don't get the whole sketchbook gummed up with sloppy paint. These "outside the margin" pages can get really beautiful when my focus is elsewhere. When the pages get cut up using a template for the envelope shape, I pay some attention to placement but as the image is folded and glued into a container it crops and combines the image in unforseen ways. 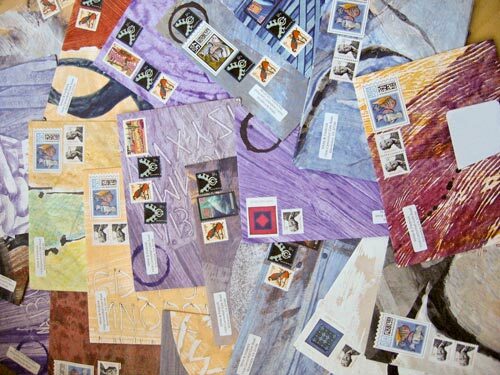 As stamps were adhered, Warren and one of Zoe's friends asked, "Did you photograph these? They are really beautiful." So I did that before mailing these paintings out as messengers sneaking handmade art into daily life. In Mr. LaHotan's second-grade art class I was excited when we were going to make things out of clay. But before we could move from painting to pottery, we had to tell him the difference. Since it seemed so obvious to me that clay was 3-dimensional, I stayed quiet. He stressed that when we worked in clay we had to observe our progress from every direction. Surprisingly, I still see it differently. 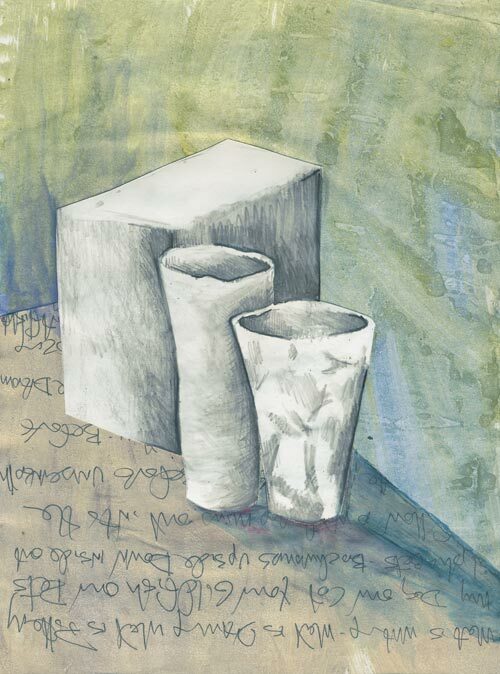 Trying to combine what I love about working on paper and what I love about 3-dimensional clay I am mixing my paint so it is like slip and mixing my slip so it is like paint. I write in my fast, illegible script and paint in my notebook. 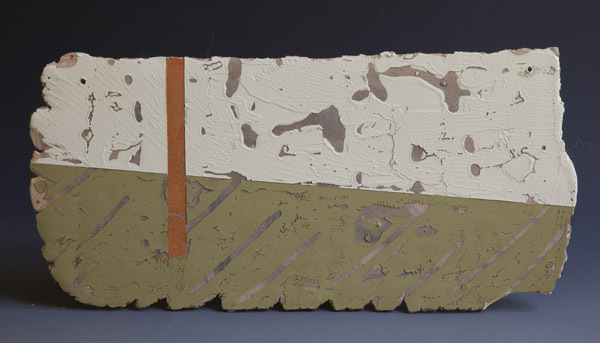 Then, transitioning to slip and clay, I search for the same feeling. When the claywork drawing seems more exciting, I alter my sketching materials yet again. 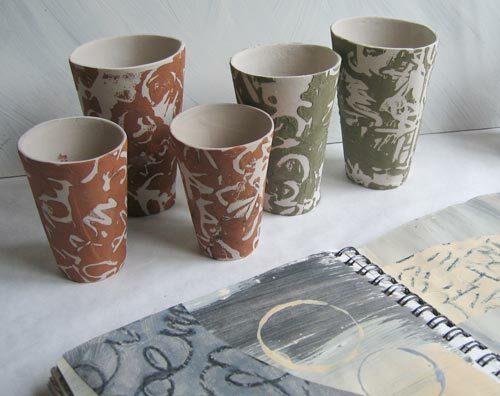 The cups above are the result of printed handwriting; the page below shows template-shaped ideas for the cups. 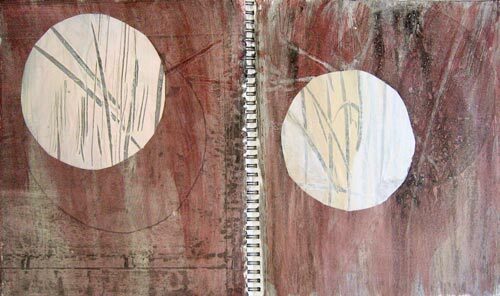 This page is an archive of recent entries in the sketchbook category. pottery is the previous category. solstice is the next category.